A HERO WHO SAVED OTHERS FROM TERRORISM? In 1980, it struck John Lennon as he was entering the Dakota, his residence in New York City. A “terrorist” killed him—Mark Chapman--a young man who said “there was a little bit of the Devil in him.” That little bit apparently grew enough to fill him with enough rage and hate and envy and all the things that drive a human to insane acts. He claimed in his statement to the police that he saw John Lennon as a cardboard cutout, not as a human being. I wondered if the Terrorists who attacked the World Trade Center thought of America as a cardboard cutout. If they did it made it easy for them to kill indiscriminately, just as it had made Mark Chapman kill John Lennon on December 8 without a blink.. In memory of Lennon, a shrine was erected in Strawberry Field, just across from the Dakota apartments where he and Yoko lived. Strawberry Field was brought back to life the other evening in memory of the “quiet Beatle,” George Harrison, who died at age 58 from brain cancer—another form of terrorism that attacks from within. Personally, I wasn’t a Beatle fan. I’m not a music fan at all, so its not in disrespect that I have little knowledge of Harrison’s contribution to an era of music that falls within my generation. When the Beatles hit America, I was en route to the Marine Corps and then to Vietnam. My mind was on fighting “terrorism,” not singing songs or listening to music. 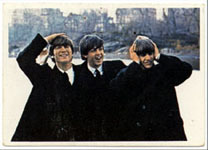 But over the years, I have found that the Beatles branded the hearts of many millions of people throughout the world. Their name and their style live with the legends not just of music, but of a reformation of attitude, a reconstruction of thinking within an evolving generation. I wanted to go to the vigil not to honor an old friend, but to witness people giving tribute to an icon. I’ve found a sense of reverence at vigils lately. Attending so many here in New York City in the wake and aftermath of Nine Eleven has been a healthy experience for me. After Vietnam, I shut down my ability to honor the dead. I guess it was a way of protecting myself. But recently, I’ve opened those floodgates, and been able to feel the “loss” of others, and in some minute way, let myself grieve over the loss of so many of my friends and comrades in Vietnam, as well as for the Vietnamese people who suffered through the traumas and horrors of war. I noted that at a vigil people’s hearts seem to melt with the candle wax consumed by the flickering wicks that burn sallow light in the darkness, as though that small flame were a repository of a life full of memories, feelings, emotions of love, caring, and, of course, sadness at the passing. 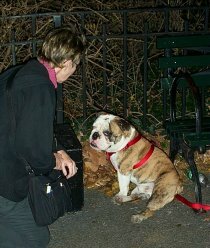 To reach the vigil, my wife and I walked through Central Park from the East Side to the West Side. The journey was not a joyous event. Central Park is dark and ominous—kind of a “Jack The Ripper” movie set. Park lights offer a pale glow oozing into the shadows of trees and bushes where “evil” may lurk. At the vigil, an air of rejoicing filled the air. 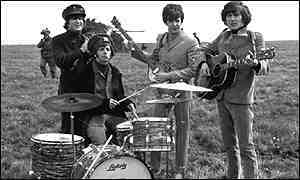 Beatle music wafted through Strawberry Field. Voices were volumed down a low murmur as people gathered around the shrine to John Lennon, which now had been converted to a shrine for George Harrison. Hundreds of candles and thousands of flowers created mountains of memories of the man whom many called the “spiritual power” behind the Beatles. 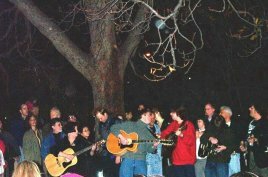 Groups of old and young were clustered about the park, singing Beatle songs under the clear, warm December night. A bright moon glistened above as though placed there to let the world below know the heavens were in harmony with the people it shined upon. A bagpiper came and began to “pipe George to heaven,” a tradition in honor of the dead. 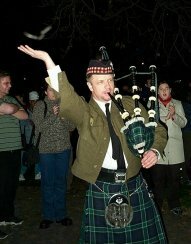 But the loud screeching played by a seemingly inexperienced piper drowned out the singing. There was a moment of tension as the crowd politely moaned at the intrusion, but then in true George Harrison Beatle style, resolved the issue by breaking into the song: “Let’s Work It Out". They worked it out. The event, I thought, was a vigil within a vigil. 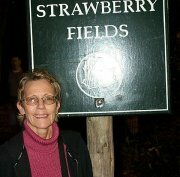 Here, at Strawberry Field, another hero was being honored. 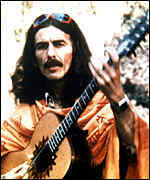 The songs Harrison wrote for the Beatles and the music he played had become a sanctuary from “terrorism within” for many who came to honor his death. If George Harrison was indeed the “spiritual power” of the Beatles, perhaps his magical skills in music writing and the telling of stories through lyrics, had kept someone from falling off the edge of life. Perhaps his skill with a pen had inked out deep-rooted messages of love and tolerance of others and touched a “lost soul” trapped in the terror of life. If that were true, then George Harrison was a Sentinel of Vigilance. He was a “hero.” Like the firemen, police or emergency workers of Nine Eleven, he may not have rushed into the burning embers of the World Trade Center and hauled people over his shoulder to safety, but, his words and their impact might have reached the despondent, suicidal human soul hanging by the threads of self-worthlessness. They might have strengthened that “terrorized soul’s” resolve to live just another day—just enough to come back to their senses and become a viable human being. No one will ever know what impact he had on disenfranchised, or how many his music might have saved from desperation, or, how many hearts he might have opened with the keys of love and compassion that filled the themes of the Beatle music. As I watched people kneeling and the tears flowing from their eyes, I noted their tears were not unlike those that fell from the loved ones of the victims of the World Trade Center. They were tears of honor and privilege, christening the memory of someone who had meant so much in life, they were willing to display their sadness at his passing in public. 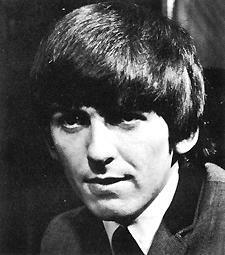 I had to salute George Harrison, even though I didn’t know him. Just as I had saluted the heroes of Nine Eleven, even if I didn’t know them. Heroes of Terrorism come in all forms. I think George Harrison must have been one of them. I’m a sucker for a good deal and a great salesman. I found that to be truth one more time as I strolled the K-Mart in the East Village, and heard the Blue Light Special being announced—a free knife to be given away to all customers just for shopping at K-Mart! To my delight, the barker was touting Ginsu Knives. For the first time in history, the Ginsu was going to be sold retail, he announced. K-Mart was going to be one of its biggest outlets. I had been thinking about getting a knife to carry in my backpack for some sort of protection. Not that I really need one. I’m 6-4 and weigh 266.5 pounds. People make a wide swath around me because I have a rather threatening countenance—not intentionally—it’s just that I’m serious about most things and find smiling difficult. But I realized that if I were ever in a life-threatening situation where I needed protection, I had none except a loud growl and a grimacing face. On the practical side, a small paring knife would be utilitarian when I needed to cut something, or open one of those incredibly sealed plastic packages that require superhuman force to enter. My wife and I have owned an original Ginsu for over thirty years. I didn’t need to be sold on its long-lasting or multi-purpose value. I’d cut tree limbs, meat, tomatoes—even butchered a wild boar I shot on Catalina Island with it. My head bobbed like one of those “dunking ducks” that forever goes up and down into a glass of water as he demonstrated the Ginsu’s ability to “cut anything.” I was pre-sold. My mouth began to drool when he turned the “free” into something more intriguing. 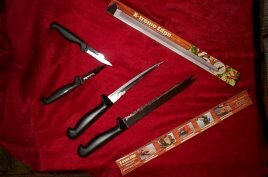 For only $22 cash, you could get not one, not two, but three Ginsu Knives if you bought right then with cash. Wait. There’s more, the said, aping the famous “pile-on” commercials on television that turn a single offer into a mountainous value of additional products. I had my money out. With the Ginsu deal, I would be totally armed to fight Terrorism. Three Ginsu Knives with indestructible blades, two paring knives, one fillet knife, and two juicers—I was ready for anything, counting on nothing. I could fight anyone anywhere and refresh myself between battles by drinking orange juice with my juicer plug. I turned over my cash, grabbed my package and headed out of K-Mart, happy as Knight about to enter the Championship Challenge. I was armed to the hilt for any Terrorist or enemy of state, neighborhood or family. Plus, I figured on the realistic side, the knives would make great Christmas gifts if I didn’t receive a call from the White House to become Deputy Chief of Homeland Security. As the cold air of reality hit me upon exiting K-Mart, I thought about the vigilance of the Ginsu Knife blade. It was a manufacturer’s example of Semper Vigilantes—Always Vigilant. My “old” Ginsu knife was still as sharp and utilitarian as it was three decades ago. It still could cut through anything. It was there, always ready. Always Vigilant. Terrorism, I thought, fed on the dull blade of readiness. Terrorism waited for the knives of a nation to lose their keen edge of readiness. Terrorism sat back in the shadows of complacency counting the minutes until a nation’s knife of preparedness became so dull it couldn’t cut a tomato. America hadn’t prepared for an attack. Its sharp edge had been dulled, caught off-guard by the boldness and insanity of what could happen if we weren’t prepared. People and nations have a tendency, like a knife blade, to become dull and complacent after prolonged disuse of vigilance. It happened at Pearl Harbor, in Oklahoma City, at the World Trade Center and the Pentagon. It could have happened at the White House if the passengers on the ill-fated plane hadn’t assaulted the Terrorists. Currently, our nation’s attention to Terrorism may be razor sharp, but as time passes, and the “threat” desiccates, as the memory of September 11 fades as it did with Pearl Harbor, I wondered if our vulnerability to Terrorism will grow in proportionately dull. The Ginsu Knife was a reminder that a blade can be kept sharp over long periods of time—decades, even centuries-- if vigilance is manufactured into the product. This meant we needed to do more than wave flags, or think that killing bin Laden would erase Terrorism from our lives. We needed something to sharpen our keen edge all the time—something to keep us Semper Vigilantes—Always, not Sometimes, Vigilant. While it isn’t probable that every American household be trained and qualified in how to use a machine gun, or stow it under the bed in the advent of an attack, it is critical that America find some tool like the Ginsu Knife to remind itself that protection from Terrorism is a matter of keeping one’s blade of preparedness sharp and ready to attack any threat. One way to achieve this sharp edge is to take the Pledge of Vigilance. Once taken, it can be restated daily, weekly, monthly. Taking the Pledge of Vigilance repeatedly over time is like sharpening one’s blade of preparedness. It forces the mind to keep the foremost thought alive and vigilant about battling those threats to our freedom that attack us either externally—such as the September 11th invasion upon our security and freedom---or, those more insidious attacks that come from within. Internal Terrorism can only be fought with a keen, sharp emotional blade that cuts through the power of the crippling feeling or thought and exposes its entrails. When we develop the power to carve into the marrow of our thoughts and feelings, we realize that F-E-A-R is nothing more an acronym for False-Evidence-Appearing-Real. We begin to realize that Intimidation is nothing more than lowering our self-esteem on the grounds we are less than another because “we,” not “they,” are comparing ourselves. Being vigilant allows us to fight the rut of complacency that we are “always going to be this way,” and to take action against the status quo that often buries us in a grave of defeatism and turns us into sniveling victims of society, or want-to-be contenders that challenge the opportunities we are offered under a free state to escape our self-imposed limitations. That’s why I believe the Ginsu Knife should be given to children for Christmas. 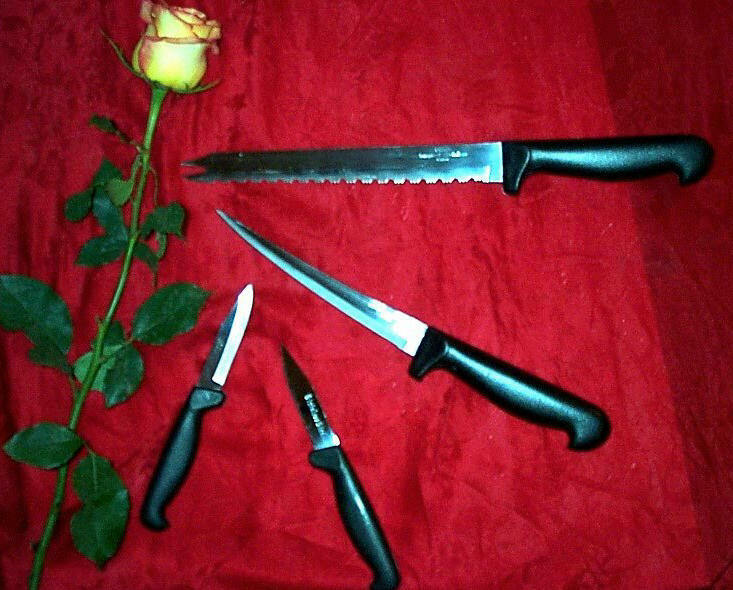 I don’t mean the real knife, but rather the emotional one. A child is vulnerable to fears and injustices we cannot fathom. As adults, over the years, we have buried our own fears, intimidations and complacencies in deep dark caves and tunnels within our minds. The Terroristic feelings reappear out of the shadows of the past when we feel low, or less than, or are stricken by fears of unworthiness, or feelings of inadequacy. The Terror of thinking you are unworthy, or a victim of society, or stuck into a grave of routine and unhappiness is just as threatening as opening an envelope and inhaling anthrax. “Ginsu Emotional Strength” is about teaching a child to cut through his or her Fear and find the Courage to fillet it. It’s about a child knowing that if he or she keeps a vigilant eye open for feelings of Intimidation, the Ginsu Knife of Emotional Security will cut through the feelings of being “less-than,” or “not-as pretty-as,” or “not-as-rich-as,” or “not-as-popular-as” and reveal the conviction necessary to fight the intimidation. The Ginsu Knife Of Emotional Security to me is the Pledge of Vigilance. If one takes the Pledge, and reaffirms it daily, weekly or monthly, it sharpens the child’s ability to fight Internal Terrorism. It arms the child with ability to peel away the layers of fear, intimidation and complacency so he or she can find the courage, conviction and action necessary to counter-balance these Internal Terrorists. 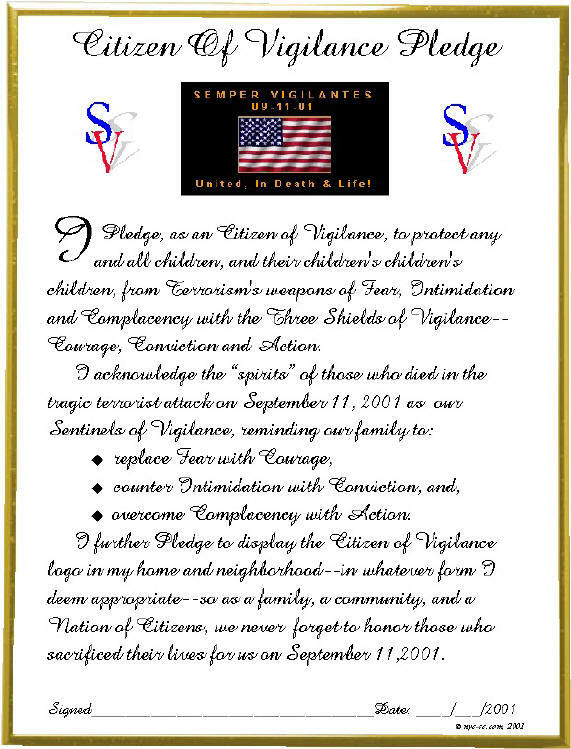 Taking the Pledge of Vigilance as a parent of a child, or the loved one of a child, or the grandparent of a child, helps the child battle Terrorism Within. It provides a guardianship of the child’s emotional well-being so the collateral emotional damage of Terrorist Feelings will be minimal. I believe the Ginsu Knife of Vigilance will last a lifetime. It will cut through any Fear, any Intimidation, and any Complacency. And it’s on sale now. 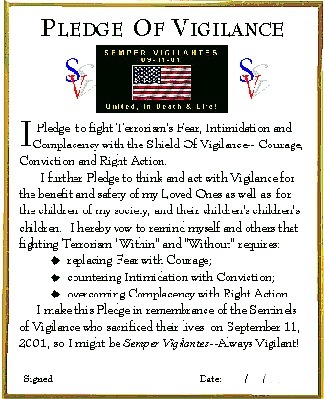 For just the effort of taking the Pledge of Vigilance you receive not just Courage, not just Conviction, and not just Action to replace fear, intimidation and complacency—but you also receive as a bonus for acting today, the knowledge you are doing something vital to fight Terrorism in your child or loved one. I guarantee it will do all of this and more…or, you can have your money back. Go To: "Day Of Infamy"